15/12/2016 Amman Mayor Aqel Biltaji has confirmed that the Greater Amman Municipality (GAM) will not take violations of the Public Health Law lightly anymore, and it will work towards enforcing the prohibition of smoking cigarettes and ‘Argileh’ in public places and coffee shops. During an agreement signing with the Royal Health Awareness Society (RHAS) under the title “Amman: A Healthy City”, Biltaji reiterated that the Municipality is continuing its crackdown on shops and outlets violating the law, including those that disturb residents in the vicinity, and those that work late into the night, in addition to shops causing noise and obstructing pavements, which violates the licenses they have been granted in residential areas. Biltaji added that it is everyone’s duty to work hand in hand to help mitigate the dangers of youth addiction to smoking and drugs, which has become a nationwide concern. The Mayor stressed that GAM prioritizes health and the environment, and is working on providing citizens with safe, healthy surroundings in response to the directions of His Majesty King Abdullah II. He said that GAM aspires to become an environment-friendly, healthy, attractive and safe city, which requires public-private sector cooperation. Signing the partnership were Mayor Aqel Biltaji and RHAS representative Dr. Rami Farraj, Chairman of Board of Directors. 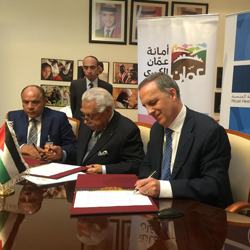 The partnership will see the expansion of RHAS’ flagship “Healthy Schools” program in Amman. It will also witness the implementation of joint activities that promote health awareness about chronic disease prevention, as well as their potential risk factors such as smoking. 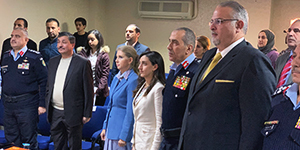 Farraj stated that current RHAS initiatives focus on creating a health culture in the society, which aim to correct negative behaviors and encourage healthier lifestyle for Jordanian citizens. RHAS is also focusing on the young generations, most of all, through its programs such as that of the “Healthy Schools”, but is also making sure to reach out to different social segments. Farraj also said that RHAS is partnering with GAM to combat smoking, especially with regards to enforcing the ban of smoking in public places. RHAS is ready to launch awareness-raising campaigns that complement GAM’s efforts in this matter, especially when it comes to the widespread opposition it is facing. City Manager Eng. Omar Al Lozi noted a tangible improvement in the citizens’ reception of health awareness campaigns, as they have been interacting with said campaigns, especially those launched by GAM, the Ministry of Health and civil society entities. This only goes to show that we need to intensify our efforts as we are clearly on the right track. RHAS Director General, Hanin Odeh, commended the continued partnership with GAM, from organizing international health days such as World Diabetes Day and World Road Safety Day, to supporting RHAS initiatives, such as the “Cleanliness is Our Culture” initiative, which contribute to the overall improvement of health awareness in society. 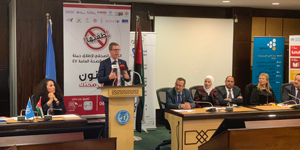 The partnership states that GAM and RHAS will implement awareness raising programs and activities about health and road safety, in addition to implementing other joint initiatives in Amman. Support in this partnership will be through offering venues for activities, helping with printing handouts, facilitating outreach to enabling donors, as well as advertising joint activities and awareness campaigns on different media outlets and social media platforms. RHAS was established in 2005 under the direction of Her Majesty Queen Rania to encourage healthy practices across the Kingdom and implement initiatives and programs in preventative care. RHAS implements several developmental programs in response to local community needs, such as the National Accreditation for Healthy Schools, Think First, Shababna, and the Healthy Community Clinic to address the needs of local communities, which are well-aligned with the national health agenda as well as with RHAS’ vision for establishing a healthy, safe Jordanian society. Attending the signing of this partnership were: City Manager Eng. Omar Al Alozi, the Vice City Manager for Regional and Environmental Affairs Mr. Bassem Al Tarawneh, the Director of Health and Vocations Control Dr. Mervat Mheirat, Director of Legal Affairs Samar Al Hiyari, the Director of Media and Communications Mr. Ibrahim Hashem, in addition to RHAS Director Ms. Hanin Odeh and Media and Communications Director Mr. Amer Al Mashini. An analysis of 76 studies about antioxidants shows that they increase mortality! B-Carotene, vitamins E + A are the worst.